This isn’t a fine example of camera work. The ‘film’ is still a treat: seven-month-old Nemo blowing bubbles in her wading pool. She started doing this two days ago when we filled the pool for the first time. I kept trying to catch her in video, but she was too interested in what I was doing. This morning, I found that if I stick my hand in the water and swish it around, she joins in by ducking her snout under the surface and bubbling. I’m melting, and it’s not because of the heat. 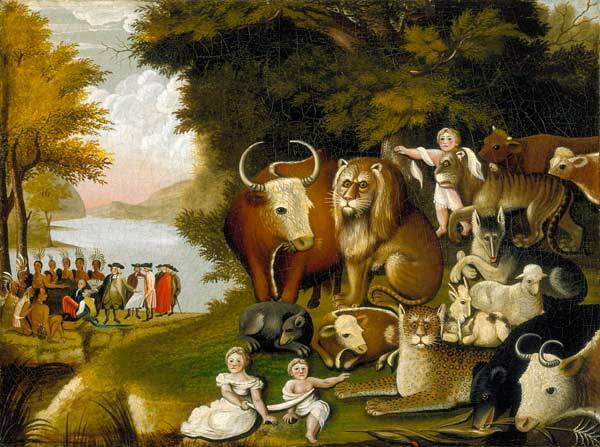 In 1826, American folk artist and Society of Friends minister Edward Hicks created “The Peacable Kingdom”. While it’s not in a style that I find particularly appealing, the content of the painting, its message, strikes a chord. In the foreground are a number of different creatures, some of which I can’t identify simply because of the manner in which they were represented, but clearly both predator and prey lying down with one another. There are cherubim and seraphim, as well, and in the background, English settlers meeting with Native Americans. I don’t pay attention to the human interaction; so little, in fact, that I’m always surprised when I see it. Suffice it to say that there appears to be some manner of commerce taking place involving blankets and, given how that type of exchange often worked out to the detriment of Native Americans, I apparently choose to ignore it each and every time I view the painting. I simply refuse to see. But the animals? Now that is an altogether different story. I relish those innocent interactions; revel in the way they coexist. And while it’s unlikely that, in the wild, a lion will lay down with a lamb, interspecies cooperation isn’t a rare event, particularly here on The Quarry Farm. 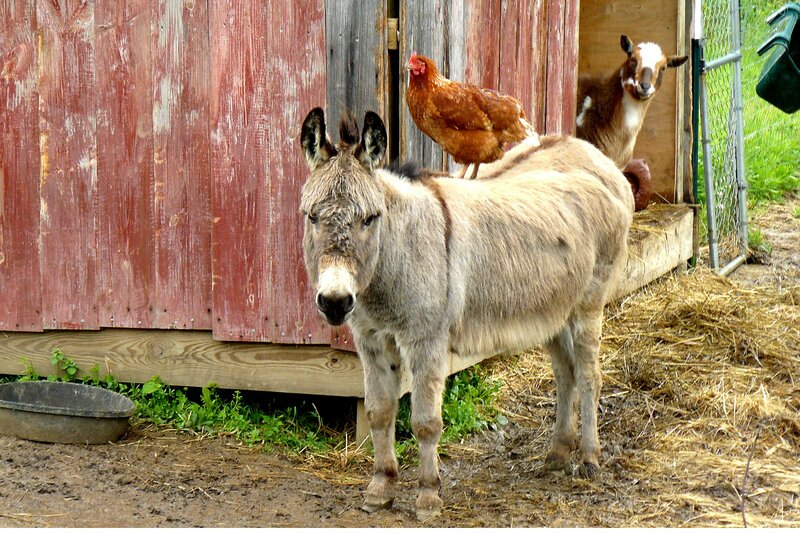 I’ve grown accustomed to seeing the chickens ride Buddy, the resident miniature donkey, or any of the six goats that also live here. I’m not surprised to see Snitch, the neighbor’s cat, padding under Mister Bill, the extravagantly tall Boer goat mix, around a pig or two and sideling on by Johnny, the Canada goose. 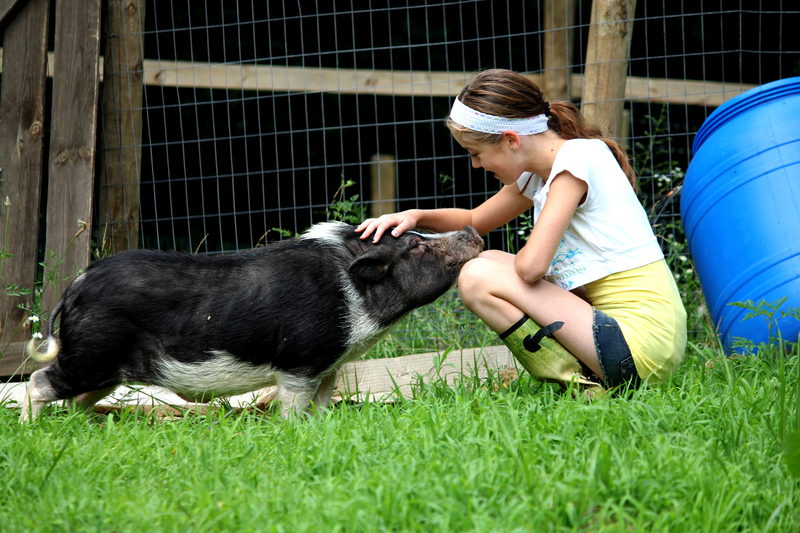 The goats play with the pigs, the pigs play with the chickens and Buddy whips everybody into a (relatively) friendly frenzy every now and again, especially now that spring is just around the corner. We’ve even seen wild rabbits lying out in the open and nursing little ones old enough to have left the nest, but still willing to nurse. Even so, and despite all of that, I witnessed something the other morning that made me stop and stare. 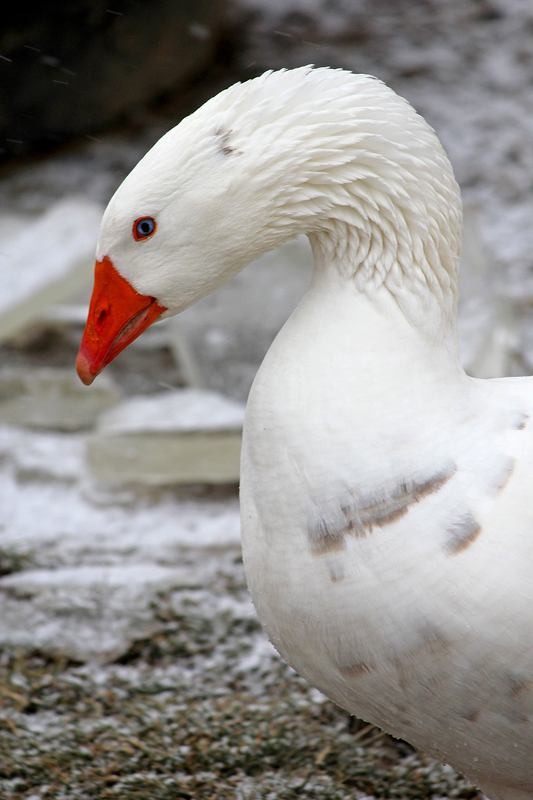 Although we named him something altogether uncharacteristic of his gender, Gigi is a gander, an Emden goose who is, characteristically this time, very protective of the two geese in his flock. He came here several years ago from Van Buren State Park, where he and Louise (the other goose’s name is Henry and yes, yes, we know) were abandoned. Gigi can be so protective, so surly, in fact, that we encourage visitors to give the trio a wide birth. Gigi is the gander your mother always warned you about: quick to hiss and threaten and quicker still to follow through on that threat with a wing beating or a hard pinch with his bright orange bill. Madmartigan is one of three pygmy goats that we adopted from a failing goat herd on the eastern side of Ohio four years ago. 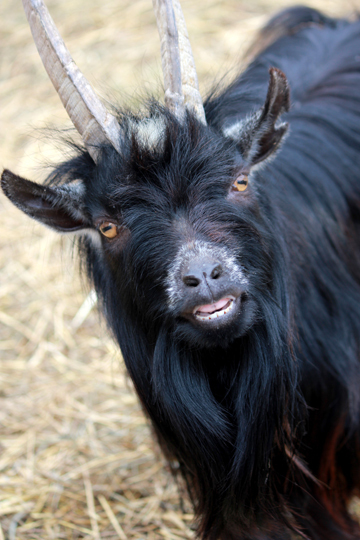 While generally good natured, like most goats, he has a fondness for his fodder. When food’s involved, all bets are off and he can, and does, do whatever he feels necessary to secure his own little patch of whatever. Being male, Madmardigan also has a ridiculously impressive set of horns, horns that spire up from the top of his head like twin missiles. And when he’s staking claim to a flake of hay or a patch of grass or an apple or three, he liberally applies those horns to heads and backsides and bodies; whatever he can reach to drive his point home. Individually, these two are more often than not at the core of any discontent. Together, though, at least earlier this week, the two were quite fond of each other. Gigi would slide his neck along Madmartigan’s back and nibble through the hairs there and up his neck and behind his ears. For his part, Madmartigan would gently nudge him with his horns, prompt him to continue her gentle ministrations. 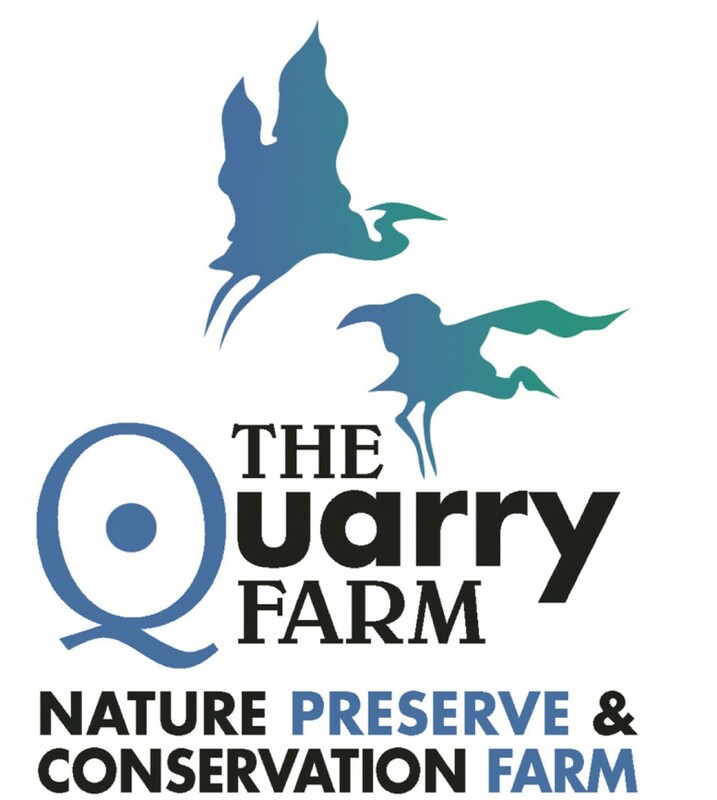 And so here we are on The Quarry Farm, our own peaceable kingdom. 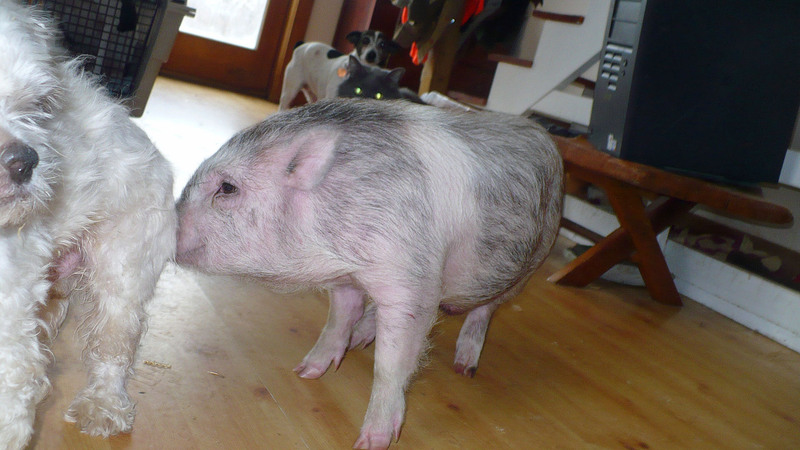 A little less than a month ago, we made a relatively short drive north to pick up a potbellied pig that, lost or abandoned (though most likely abandoned), had wandered into our friend June’s yard. Not knowing about us at the time, June called Laura Zitzelberger at Nature’s Nursery, who, in turn, called us. The hour-long ride back was interesting; interesting in the sense of the ancient Chinese curse, “May you live in interesting times.” Given to reckless behavior, I had decided to pick him up sans crate, so the little pig — and he is indeed little, weighing in at just a smidge over 30 pounds — was loose in the car. He spent nearly as much time on my shoulders doing his best to climb up on top of my head as he did on the seat. Eventually, though, he did settle in and down, sprawling in the back and resting his head in the palm of my right hand. On arriving home, his behavior in the house was little different from his initial behavior in the car, that is to say, “hell bent.” He chomped and rooted, prodded and postured, picking fights with any and all comers, even with those more inclined to run away, myself included. I grumbled. I growled. I cursed. 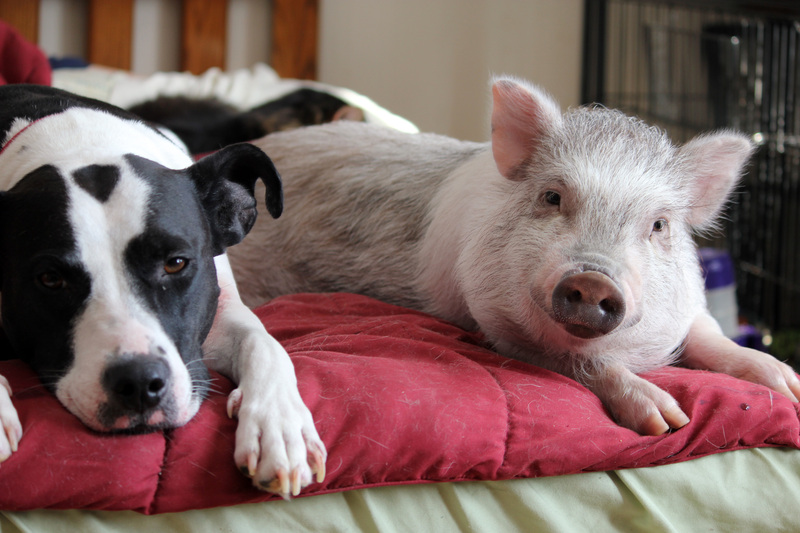 Bob is a dear friend of ours, one of four pigs rescued last winter and one of two of the four who now live on The Quarry full time, along with Beatrice, aka Little Pig. At first, his behavior left something to be desired. 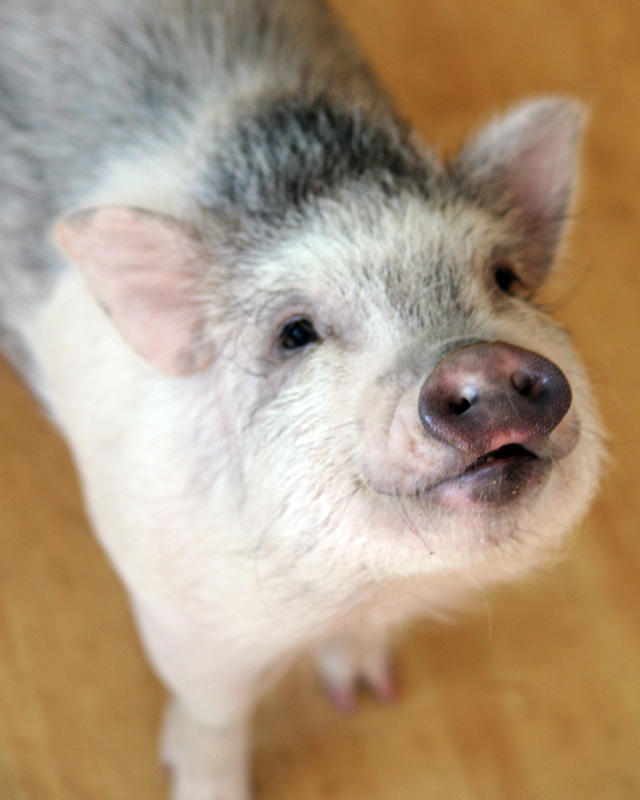 Now, however, he’s nearly the perfect gentlepig. Despite Anne’s assurances, I had my doubts. And so did Lolly, who maintained a discreet distance. As he was still intact, the first order of business was arranging for a quick snip. 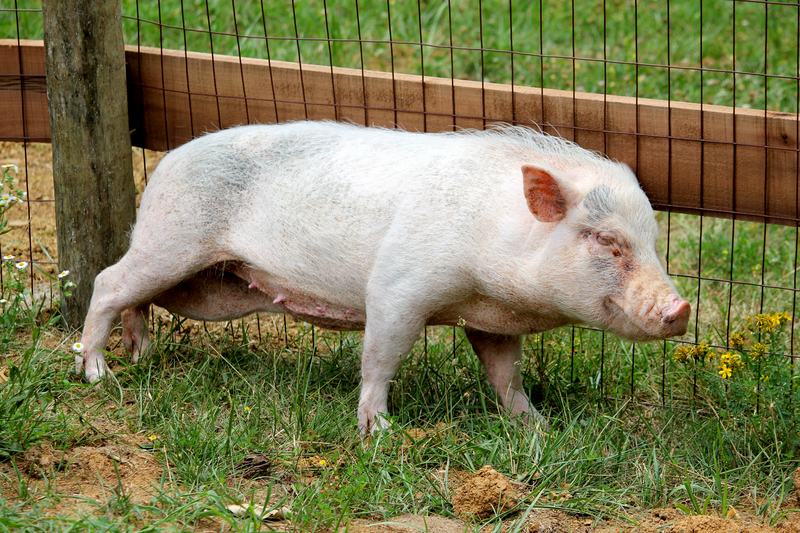 Though she’d never performed this operation on a pig, our veterinarian, Dr. Jackie Santoro, did the requisite research and the procedure came off — pun intended — without a hitch. On returning him to The Quarry, there wasn’t any significant change in behavior. He had this truly annoying habit of, when he wanted something, anything, of furiously rooting at any available ankle. 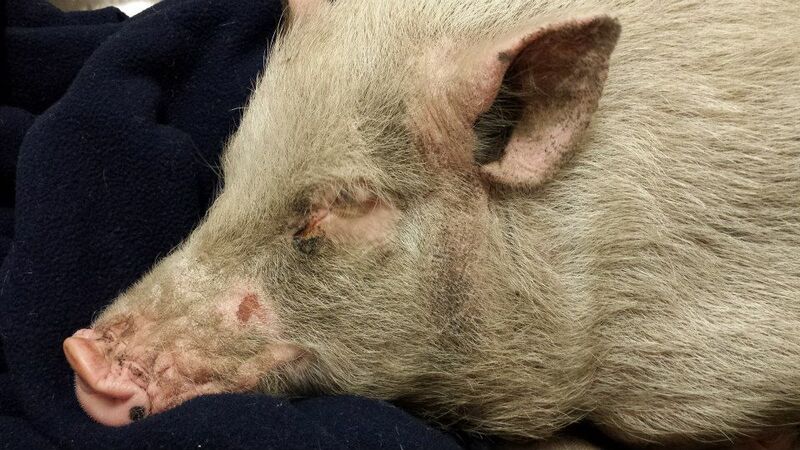 With 30 pounds of pig behind it, that nearly vulcanized snout left bruises. I threatened. I snarled. I swore. 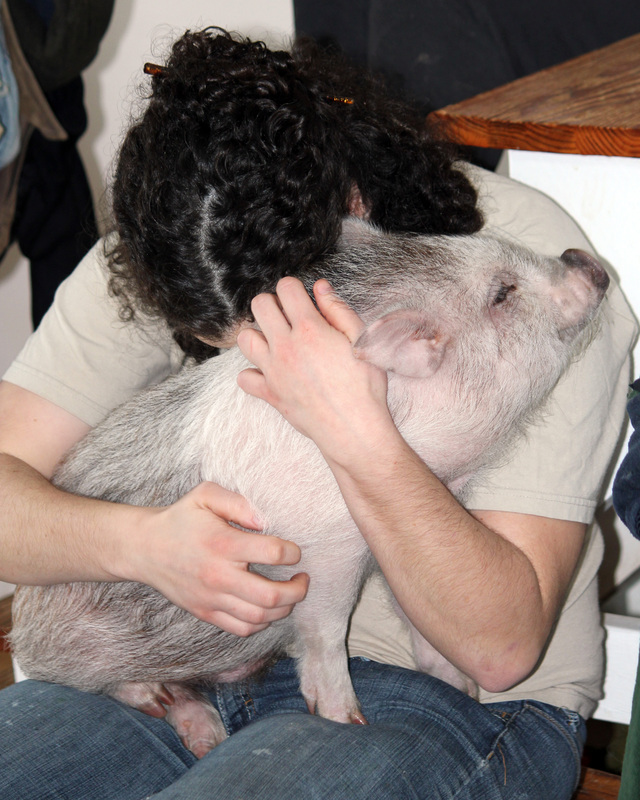 She was standing in the kitchen with the little pig at her feet. In her hands was some manner of treat: grapes or carrots or banana or some such. She would hold out a morsel and watch the pig. When he took a step back, she’d bend at the waist, deliver the treat and exclaim the encouraging, “Yes!” In a single 15-minute session, she permanently broke his annoying, destructive rooting behavior. Now, he spends his time making his way around the house. I’m not saying that there aren’t still problems. He has a habit of poking his nose into places it doesn’t belong and he and Bob will likely never be fast friends, but we all have our faults, our own clashes of personality. The bottom line is this: he’s a smart, gentle, comforting being and it shows in any number of ways. So, he’s here to stay. This is home. As children, most of us at one time or another have read, or have had read to us, fairy tales; the kind of story where the hero or heroine has to overcome great adversity in order to win out in the end. Generally, the moral of these stories is something along the lines of, “Be good. Be just. Work hard. Do these things and all will be well.” And just as most of us have heard or read these stories, we’ve experienced that life has a habit of teaching us a different kind of lesson, something a bit more realistic. I mean, life isn’t fair, right? Good guys regularly finish last and, all too often, what you earn from working hard is more hard work. That’s frequently been my experience, at any rate. So, I tend to think of myself as a pragmatist; I hope for the best, but expect something worse. There are those, however, who have described me as a cynic, and while it’s true that I don’t trust the motives of others, I consider that a survival trait, not a character flaw. So you’d probably guess that, from my perspective, there are no such things as fairy tale endings. Greta, shortly after her rescue. 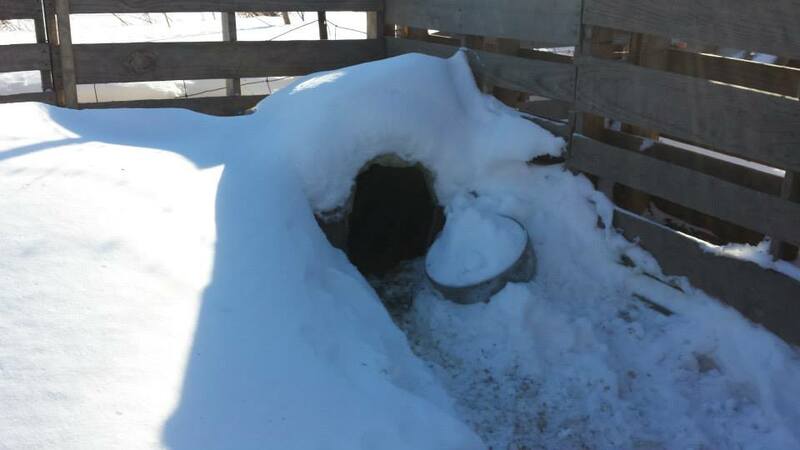 Last February, with the wind screaming and cutting and churning the air down to between 30 and 40 degrees below zero, members of both the Humane Society of Allen County and the Allen County Sheriff’s Office seized nearly 50 animals from a hoarding situation about 20 miles south of The Quarry Farm. And while this isn’t news to those of you who visit this site, the repercussions of the event, the sheer horror of the conditions those rescued were living in deserve telling and retelling. The trench that Greta and Grits survived. Shelter, for those animals that had any, were wide-slatted wooden crates open to the sky or with poorly fitted roofs, rough houses slapped together from bits and pieces of waste wood and 50-gallon plastic barrels laid on their sides. Where they had run out of proper fencing, barbed wire was looped on the ground to contain two horses and three ponies. Eight chickens survived, huddled under an abandoned car, ringed by the frozen carcasses of the chickens that weren’t so lucky. The frozen remains of two dogs were found, though only one is believed to have died of exposure; the other, it is suspected, simply starved. 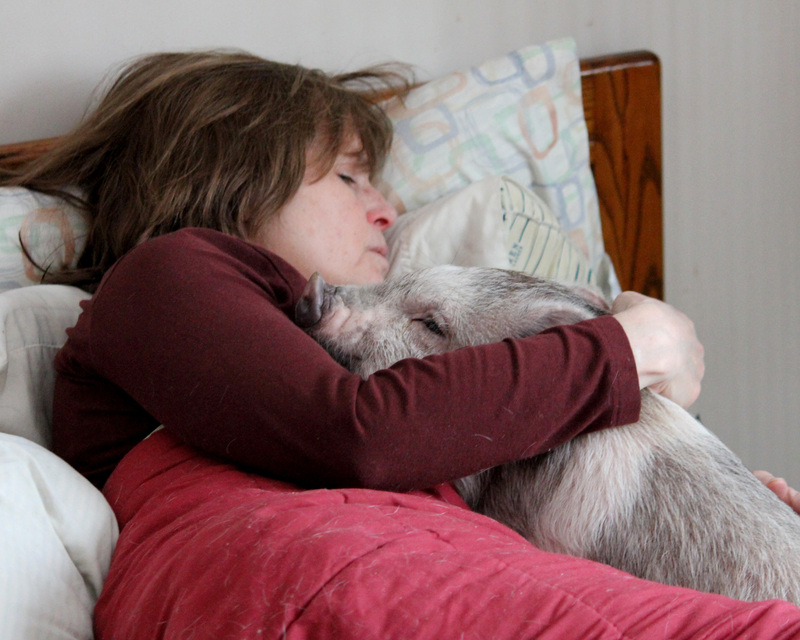 Of the animals that survived, that were rescued, four were potbellied pigs. Two, Bob Barker and Alphonse, came to live here, at The Quarry Farm. 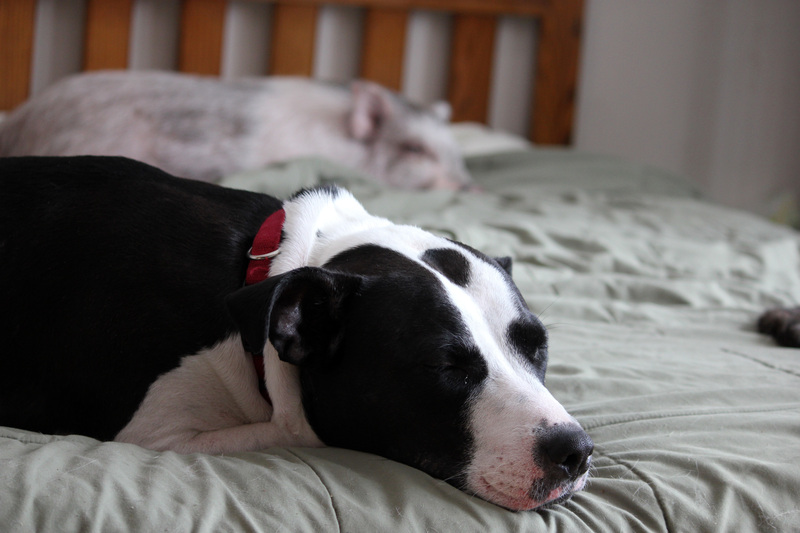 The other two, dubbed Greta and Grits, were spoken for by friends of ours down in Kentucky. 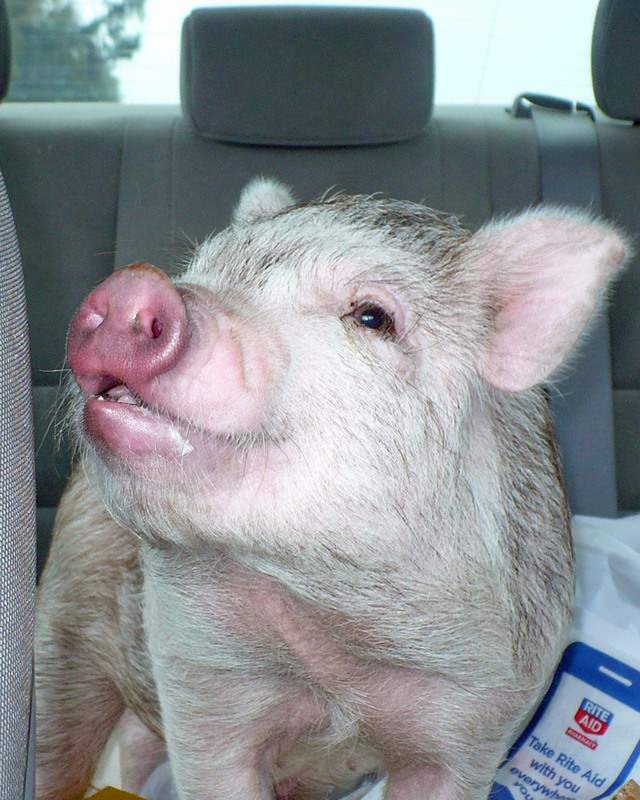 This Sunday past, Anne and I picked up the two pigs from their temporary home at the HSoAC, loaded them into Anne’s Toyota Matrix and headed south. 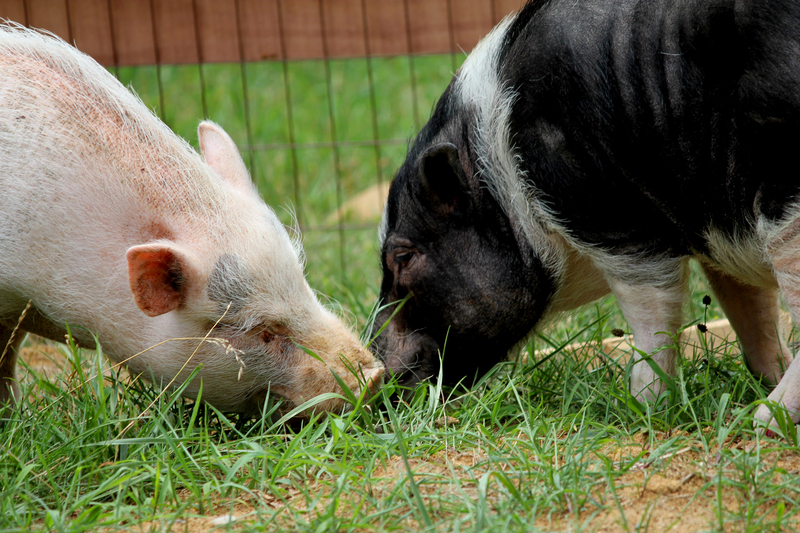 Because of the care they’d received and the socialization provided by the staff and volunteers at HSoAC, both pigs were extremely well-behaved, though understandably a bit restless. 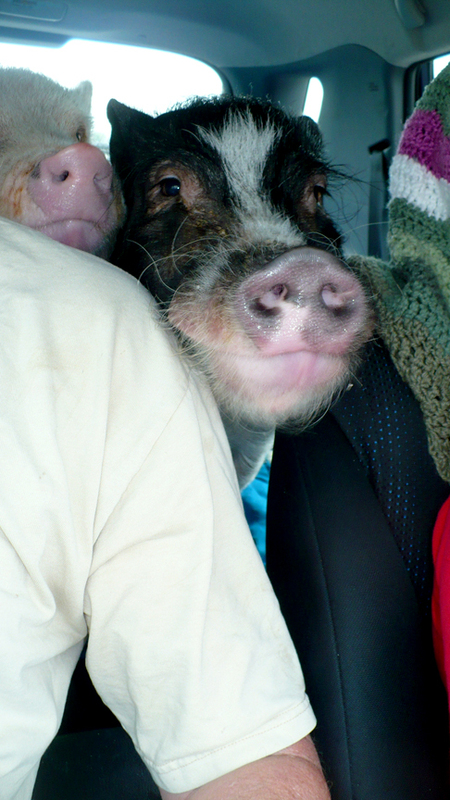 A whole grain bagel and pieces of both a cinnamon and an orange scone, picked up at a Panera in Troy, went a long way toward easing any nerves and both pigs lay down for the rest of the trip. Some twenty-odd miles over the Ohio border into Kentucky, and we’d arrived. Grits greets Erin for the first time. paddock that Bruce and Beth and Erin had finished fencing off just the night before. They immediately set to investigating their new digs, sampling grass, scratching themselves on posts and the wire of the fence and rooting into every depression they could find, but still making time for ear scratches and belly rubs enthusiastically administered by all three members of their new-found family. And that’s where we left them, at the top of a hill in their forever home, surrounded by people who will not simply love them, but care and provide for them. From the horror of a trench in the snow to a hilltop house in the sky. Here is where they’ve come, where they’ll live.